A Look Back: Don’t Name the Bats! Bruce knew Selina resented being summoned to the Batcave “like a spaniel.” And, since the matter wasn’t pressing, he squelched the impulse to use the intercom or send a message through Alfred. He waited until lunchtime and went up to the manor himself. 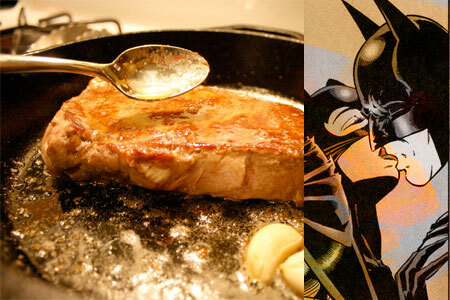 He thought Alfred was just a little too pleased that he had come up for lunch unprodded (a development that Bruce found annoying), but Selina didn’t seem to notice anything unusual about his behavior. She greeted him with the easy smile that was the norm since their talk after the fundraiser, and they chatted only of non-Bat subjects as they ate. Bruce said he was avoiding the Wayne offices. He denied it was because “Lucius had to be punished” for the disastrous Ashton-Larraby fundraiser. On the contrary, Bruce insisted, he had trained enough Robins to know that what Lucius really needed now was a free hand. He didn’t need to feel supervised, second-guessed and micromanaged because he had made a mistake. He needed to pick himself up, dust himself off, and regain his confidence as quickly as possible. With that noble declaration, Bruce wiped a crumb from the corner of his mouth, tossed his napkin onto the table, and asked Selina to accompany him back to the cave. She agreed, the easy smile morphing into one of feline curiosity. When they reached the Batcave, she curled comfortably into the chair at workstation two, picked two wing-shaped slivers of metal off the desk, and began to play. Bruce suppressed a lip twitch as she turned the pieces this way and that, trying to work out what they were and how they fit together. Then his whole demeanor changed as he underwent what the staunchest heroes in the Justice League have described as “the most frightening transformation in existence.” His jaw clenched, his eyes darkened, his entire body seemed to become denser, and those with sufficient imagination could almost envision the mask appearing over his stern features. He sat and powered up his screen, while Selina continued to play with the batwings as if nothing at all had occurred—which to her mind, it hadn’t. She put them down, disappointed, and gave him her full attention. He scowled and said nothing, refusing to be baited. “So what is it?” she asked gamely. “Diamonds,” he pronounced with a grunt. He paused, needing a moment to process her enthusiasm. She was excited, which is, of course, what he wanted. But in all the years of study, in all the years of crimefighting, in all the briefings and all the interrogations, the phrase “tell-tell” had never been uttered. She laughed—a very particular laugh, a rooftop laugh that he hadn’t heard for quite some time—a laugh that nearly always preceded her getting away with something. The bat-density seemed to intensify and, when he spoke, his voice dipped again into the deep bat-gravel. “Talk me through selling a stolen diamond,” he ordered. “Unscrupulous dealers who won’t check the gemprints to verify that any item they sell is legitimate,” he suggested. She grinned, and he considered the problem. “Recutting into smaller stones would greatly diminish the value,” he noted sourly. Bruce inhaled slowly, beginning to see the solution. Selina could almost envision Sherlock Holmes savoring a long draw on his pipe. “How secure is the database?” he asked finally. And Catwoman’s naughty grin widened into the Cheshire variety. “How secure is anything?” she asked in reply. And he grunted. “I salute you, World’s Greatest Detective,” Selina purred softly. “Thank you for your help,” he said, swiveling the chair to face the monitor. He began typing rapidly into a waiting file, and Selina began to think he had forgotten her entirely. “Done with me, or should I stay?” she asked finally. She waited. She picked up the batwing whatever-it-was again, buffed its silver surface, and used it as a mirror to primp her hair. Then she looked curiously around the cave. “Those bats are watching us,” she said at last. “Selina, do not name the bats,” he warned darkly. “I wasn’t going to name the bats,” she declared with exaggerated dignity. “Good,” he grunted. He could bring Catwoman into his life, he could accept her friendships with Riddler and Two-Face, he could overlook her favorite bar being the Iceberg Lounge, and he could even, in time, come to terms with a stolen cat figurine among the curios in his bedroom. But he simply could not tolerate her coming into his cave and assigning cutesy names to the native chiroptera. “The black one is awfully cute,” she noted. He sighed and resumed typing. “Meow,” she said, swinging her chair around. Read the completeCat-Tales #47: Blueprints now on the CT website or mobile-friendlyCat-Tales.mobi. Posted in cat-tales | Tagged a look back, anniversary, batcave, batman, blueprints, bruce wayne, cat-tales, catwoman, chris dee, clayface, poison ivy, selina kyle, the bat walapang | Comments Off on A Look Back: Don’t Name the Bats! 10th Anniversary begins: Laissez le bon temps roule! Chris Dee will be appearing at the Second Life Visitor’s Center for book signings throughout the day. Yes: BOOK SIGNINGS. Today’s offering is a 10th Anniversary edition of the Graphic Novel Prologue, exclusive to SL residents. 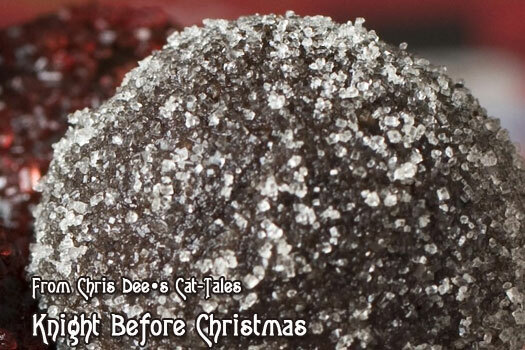 Posted in cat-tales | Tagged anniversary, cat-tales, catwoman, catwoman-cattales.com, chris dee, chris dee's cat-tales, graphic novel | Comments Off on 10th Anniversary begins: Laissez le bon temps roule! Harvey said he’d brought the rum balls. Combine first 5 ingredients, hand mixing as you go, then begin adding rum a little at a time, hand mixing until moist but not wet. Roll into balls, then roll in powdered sugar until coated. It’s been a while since I logged a general catch-up entry. I’m reasonably sure I mentioned when Armchair Detective and Not My Kink were released for kindle and mobile readers, but so much was happening in that window, putting the finishing touches on the Second Life Visitor Center and working on the pictures for the Cat-Tales Cocktails, they may have gotten missed. In any case, edits are well underway for CT 58: Demon’s in the Details, so that should be released in just a few weeks. Better still, I got myself a new phone, an Android platform. There’s a Kindle app, so I should be able to test the phone features much better now. For example, visiting the Cat-Tales homepage, I see that not all smartphones will direct to the mobile-friendly menu page, only the iPhone does. The rest of you (who are now the rest of US) can continue to use the iPhone button on the bottom menu until I get an automatic redirect in the works. Also, the new chapter of Don’t Fear the Joker is out today. I know many readers were expecting this next chapter to be the final one, and I actually did consider it since CH9 is quite short. But not only is it a complete chapter/installment on its own, there is one other non-Gotham, non-story consideration. As forum followers are aware, my A/C gave up the ghost on August 1st, timing that IMO shows a truly Jokeresque sense of humor, and since the coming and going of repairmen is apt to slow down the progress of Chapter 10, I figured it was better to get this out there. All of you can cackle with Mistah J while I keep Cashmere from hogging the sweet spot in front of the fan. ‘Til next time, Ciaomeow as we say in the real neighborhood. And stay cool.